It all starts with a block of wood. 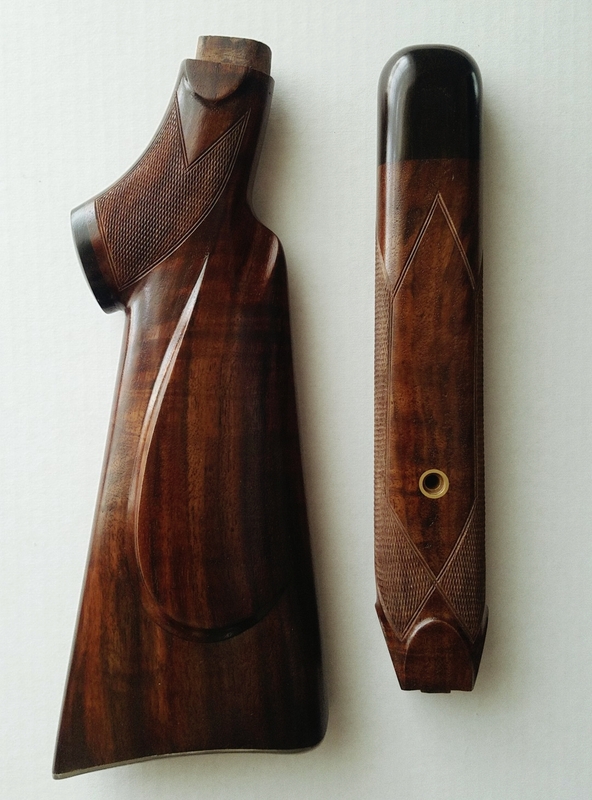 Lot’s of gun stock makers use French Walnut (Juglans Regia) because of of the strong closed grain wood that is easy to shape and has great beauty along with very high strength. Another wood that stock makers use regularly is Claro Walnut (Juglans Hindsii) This is very similar to Eastern Black Walnut. This is considered the most beautiful of all Walnuts because of it side variation of figure and color. There are other wood that can be used in custom stock making and I will address them in another post. Here at Lohman Gunsmith we are one of the finest custom gun stock makers in the United States. We shape stock blanks into fine stocks. It does not matter what type of gun it is. We do full length stocks, shotgun stocks, and bolt actions stocks. We also do grips for pistols and revolvers. We do not use CNC stock duplicating machines here. We cut the wood with a band saw and will use the mill to shape the barrel channel and the rest is done with chisels, scrapers, and inletting black. We can make the length of pull and the cast everything to the exact dimensions you would like. I will get more in depth into the stock making in future posts. This Martini Stock and forend is for 22 Long Rifle from wood blank. It has a Ebony grip cap with custom sized unghosted cheek piece. The stock Checkering and forend checker was done at 24 lines per inch. We finished with a hand rub. We also do wood stock repair, refinish, and do stock restorations on gun stocks. We have a lot experience in repair flood damage stocks. I will also address flood stocks in future posts.